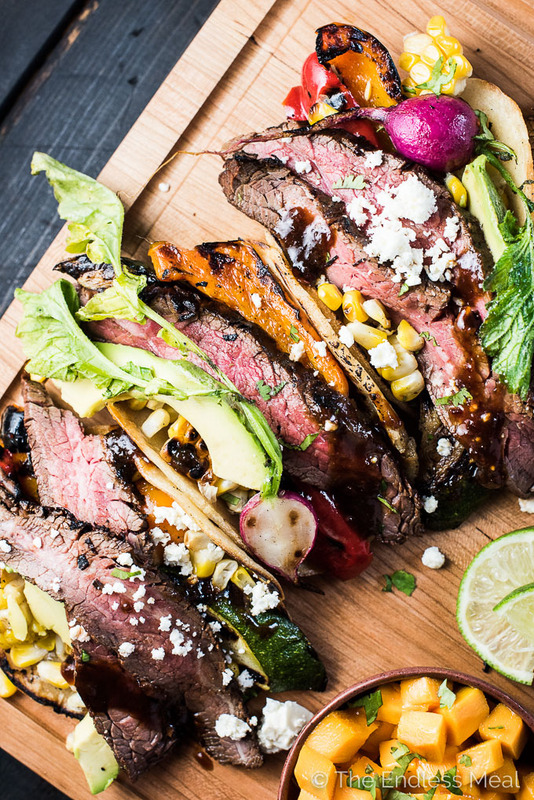 These CRAZY delicious Grilled Steak Tacos are the ultimate summer BBQ recipe. Inspired by Mexican carne asada, the steak is marinated till flavorful and tender then grilled over high heat so the outside is charred and the inside remains pink. 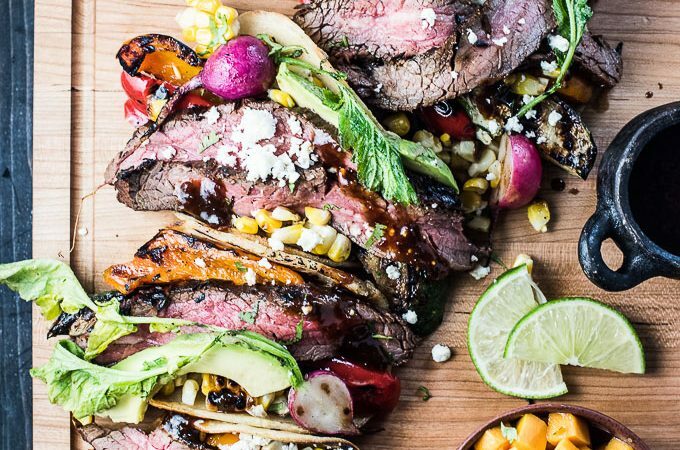 The tacos are piled high with steak and grilled summer veggies for an easy to make and healthy dinner recipe that everyone will love. Friends! I'm so excited to share this post with you today. I know, I tend to get ridic excited/ borderline overenthusiastic when it comes to good food. Honestly, I'm so happy (slash don't know how) you guys put up with me. I just can't help sharing the things I love with you. Tacos! I think we should start a petition to have them recategorized as a proper food group. You know, like reinvent the outdated food pyramid and add an extra bottom layer just for tacos. What do you think? Are you in? Steak! It wasn't all that may days ago that I said the blog is in serious need of some more steak recipes. Changing that fast. There's virtually nothing as amazing as the smell of steaks on a BBQ. Even during my 14 steak-free vegetarian years, I would still drool over steak on a grill. Wood Cutting Boards! Or should I say, the most beautiful Wood Cutting Boards E.V.E.R. Honestly, I'm in love, and I'm going to tell you all about my crush in just in uno momentito. 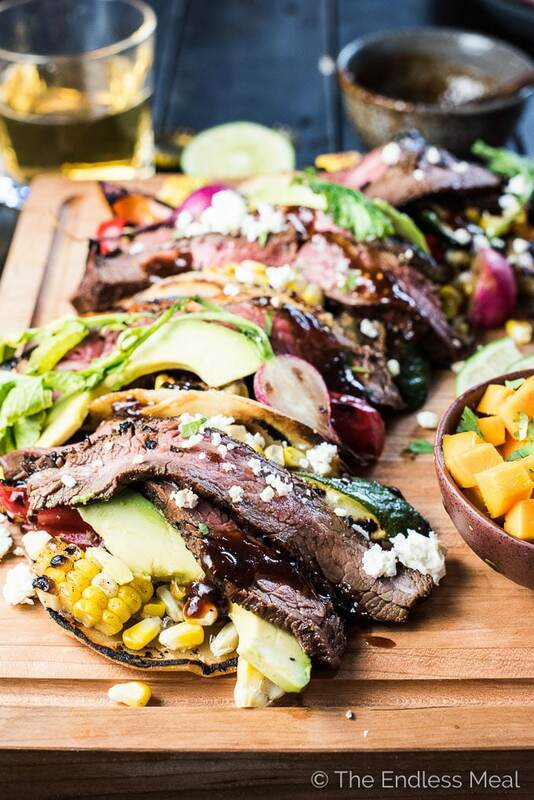 Those babies are loaded with delish grilled summer veggies then piled with steak and a mango salsa and a million other toppings until they are out. of. controoooool. Do you see all those toppings exploding all over the place? They're so good! We've got grilled zucchini, radishes, peppers, and corn. We've got mangos. We've got feta, which it turns out should be on every taco from now until the end of time. There are creamy avocados and the salty/ spicy reduced marinade. ← this is a real thing. And there's steak. Oh man … the steak is amazeballs. Before I share the low down on the steak, can we have a minute for my new cutting board? ? Did you see it? Are you as in love with it as I am? Before it arrived, with my logo engraved into it, I thought all wood cutting boards were the same. I mean, different can they be? Wrong! This one is Gorgeous with a capital G. It's made by Wood Cutting Boards and is seriously the most beautiful I've ever seen. This one is their wood cutting board with rounded edges and juice groove in cherry. Even my handsome man (who's a carpenter and super picky when it comes to anything wood) gave his stamp of approval. ? This is a big deal. It has handles on the side that are cut into the board so that it is easy to pick up. I have another wood cutting board that doesn't have the handles, and it's the biggest pain in the … to use as a serving tray. That one just went into retirement. There's also the juice groove, which I've decided is the best invention of all times. There will be no more setting a steak aside to rest only to find steak juice running all over my kitchen counter. Tell me you've been there before? Now, my steak goes straight to the cutting board and any of those tasty juices that escape get caught by the juice groove. Win! Just look at the juice groove in action. ? Let it swim around in an easy to make marinade. Slice it against the grain. That's it! See how easy it was to make that tough cut melt-in-your-mouth steak taco worthy? 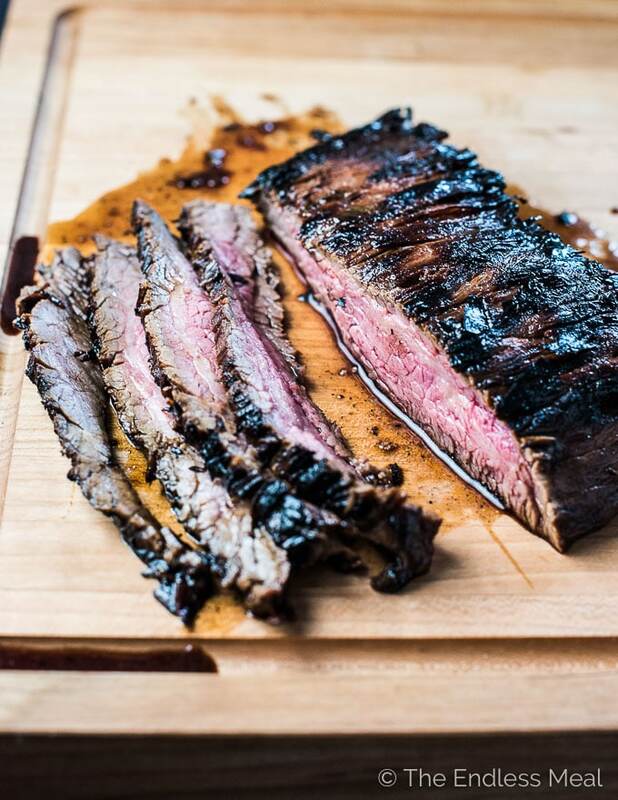 You can also use flat iron steak (like I used in the video) or skirt steak. All three make excellent carne asada steak tacos and should all be prepared the same way. ♡ Make a simple marinade with some juice and a few spices. Put the steak in a bag and pour the marinade over the top. Put the bag into your fridge and go pour yourself a beer. 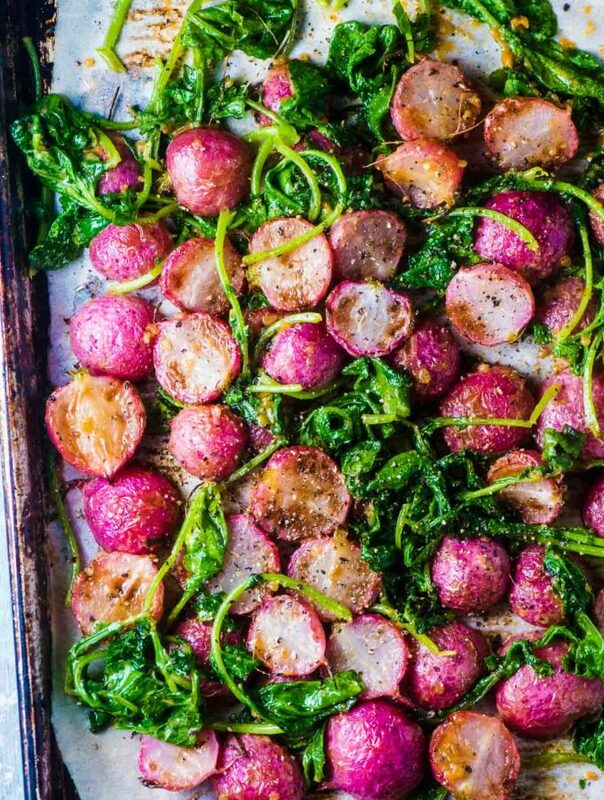 ♡ Fire up the grill. 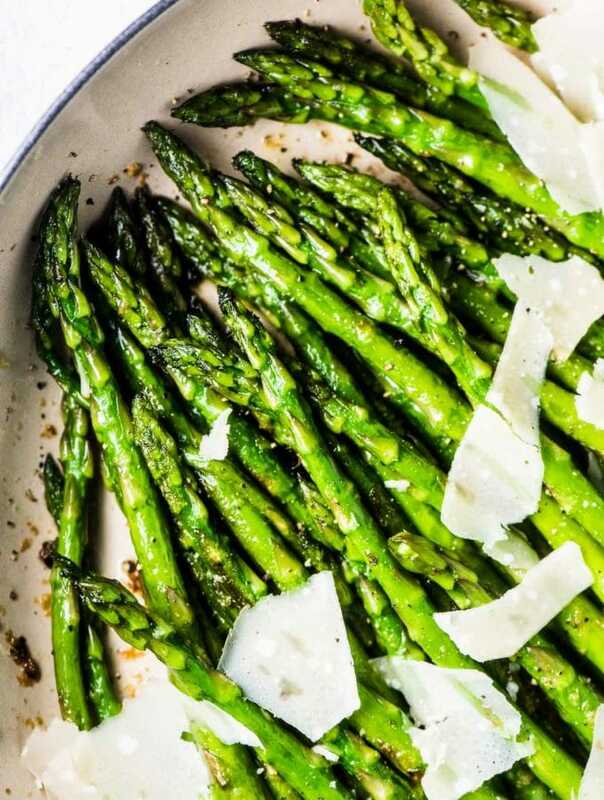 ♡ Grill the veggies. Grill the steak. Warm up the tortillas on … you guessed it … the grill. 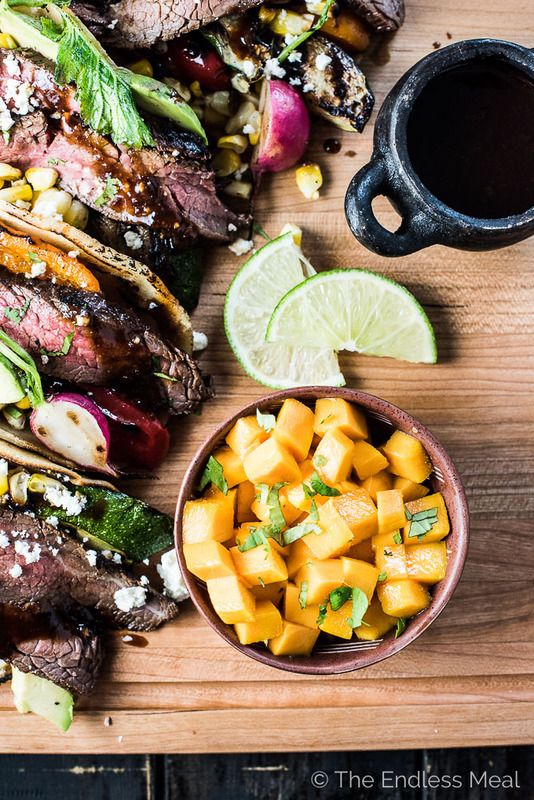 ♡ Load your taco with all those veggies and steak and top it with mango, feta, and avocados. ♡ Try your best to pick up that overstuffed steak taco. Ha! Give up and eat the toppings with your hands. In a small bowl, whisk the orange juice, lime juice, olive oil, brown sugar, soy sauce, cumin, coriander, garlic, and sea salt. Place the steak in a resealable plastic bag and pour in the marinade. Remove the air from the bag and seal it. Place it in your fridge and let it marinade for 3-24 hours. Note: I like to put a tea towel under the bag in case it leaks a little. Preheat the grill to high. Make sure it is very very hot. Take the steak out of the marinade and place it on a plate and pour the marinade into a small pan. If you're using it, sprinkle the optional brown sugar over the steak. This will help it to char better. Place the steak on the BBQ and grill for 3-4 minutes per side. Take the steak off and set it aside to rest. Slice thinly across the grain. Toss the veggies in oil and BBQ until tender. Warm the tortillas on the grill. While the veggies are grilling, bring the reserved marinade to a boil and boil rapidly until reduced to a thin syrup. 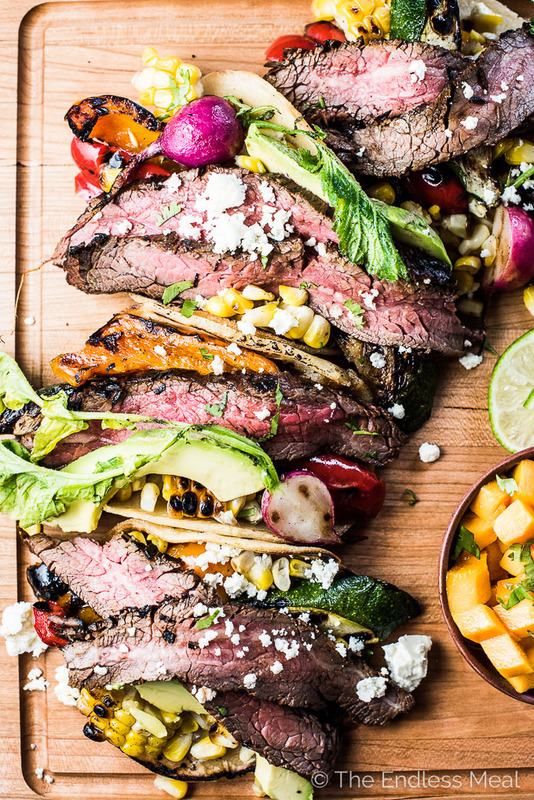 Pile the veggies and steak onto the tortillas, top with mango, avocado, feta, and a little drizzle of the reduced marinade. I've put this recipe into the paleo category. 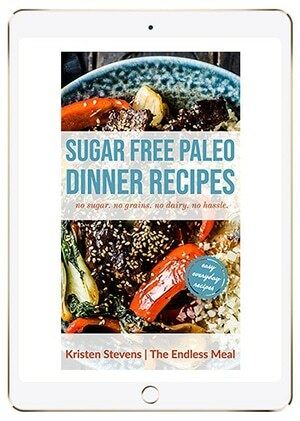 If you're paleo, sub coconut sugar for the brown sugar, use coco aminos instead of soy sauce and skip the tortillas. What a beautiful post. These grilled steak tacos look so delicious. I say time to fire up that barbecue ? ?. Thank you for sharing. Thank you so much! They are my fav summer tacos! Thank you so much! I hope you love them as much as we do! !